Sitemap shows all posts of a blog in one page. It is very important for a blog as it contains all post and visitors can find posts easily. Sitemap is categorized on the basis of labels/categories so it indexes all posts under a specific label which helps users to find what they are searching for. Since blogger doesn't have any built-in sitemap therefore it can be added in a blog only from other blogs. Sitemap is important for seo also because once your blog's sitemap is indexed by search engines, visitors could find it easily and reach posts which increases your blog traffic too and in other words it is a navigation page which makes your blog's navigation more clear. I have previously shared a simple sitemap for blogger which shows posts in a list form you can see it here. This sitemap also works as the simple sitemap but it has a cool and stylish look! You can take a look at my blog's sitemap. Moreover you can set a 404 page error and redirect visitors to your sitemap so if a visitor could not find a post which he is looking for he could read another post or find the post in sitemap which he is searching for. Follow below steps to add stylish sitemap in your blog. (2). Click on pages in the menu on left side. (3). Create a new page by clicking on New page. (4). Give a title to your page "Sitemap". (5). Below title switch to Html and paste the below code into it. (6). Replace http://www.101helper.blogspot.com with your blog link. (7). 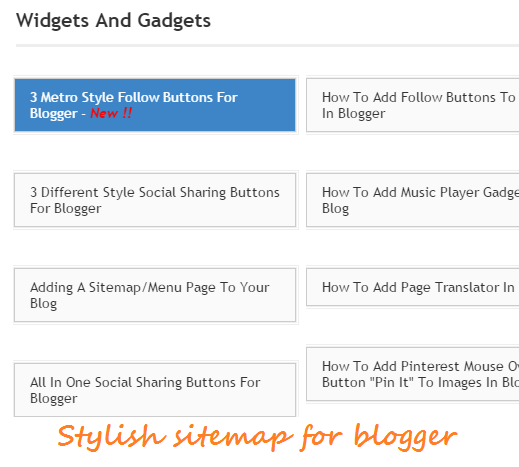 Publish the page and open it to see stylish sitemap of your blog. To change background color of tabs when hovered by mouse replace background: #3d85c6 with desired color code. If you have any question ask me in comments or contact me. Follow and subscribe to get latest updates in your inbox. Share this post with others and help 101Helper grow. Search tags: Sitemap for blogger, adding sitemap in blogger, how to add sitemap to a page in blogger, Stylish sitemap for blogger, 101Helpe blogger tutorials.